Alexis Smith has been both famous and slighted over the course of her career. Her work is complicated, cerebral, demanding careful attention. A full-scale 1991 retrospective at the Whitney Museum of American Art conveyed the range and scope of her work to the nation. As Smith reaches the summit of her career, it is possible to discern recurring themes in her oeuvre. As a native Californian, she is keenly aware of lost worlds: open landscapes covered with orange groves, old Hollywood, the era of film noir and Coconut Grove kitsch. Crucially, Smith is a writer. In one of her early performances, she styled herself as Scheherazade, the story teller. Putting together her signature collages that can be summed up with a clever riposte, Smith plays with words and relishes puns. But, as she has said, “Over time, the images beat out the words.” Smith was from the beginning postmodern avant la lettre, a writer who read and re-read (male) writers, deconstructing their famous phrases, teasing out hidden meanings. Few of her colleagues were as consistently political as Smith, who found race and sexism existing as sub texts. The subtle, oblique touch that runs through her highly detailed art works challenges us to stop, look and, also, read. Smith entices us to peruse every collaged page, and consistently rewards the effort. The centerpiece here is, tellingly, “Past Lives,” a collaborative installation Smith did with poet Amy Gerstler. The site is a classroom somewhere in the fifties, free of computers and populated with empty desks and an assortment of empty chairs that indicate the former students’ adult lives. Undoubtedly, there are young people enchanted with the experience of institutional learning, but, in this classroom, the feelings of boredom, intimidation and failure rise like a miasma. Gerstler’s wall text confirms the feeling: “Has no morals/Suffers from migraines/Refuses to bathe/Talks all night/. Broke new ground./ Lost 50 pounds/. Hates her Name/. Humiliates his children/. Can’t sit still/. Published Eighteen novels/Can’t eat seafood/. Lies to everyone/ Gets lost often/ Finds motherhood fulfilling/Succumbed to smallpox./ Sees the future.” These are voices of the children, echoing from the past, clinging to the blackboards and desks: These are voices of adults speaking of their fates. Like desks, gouged with forgotten initials, we are marked like the green blackboard with this school chalk that made us who we are. The choice to focus on Smith’s work of the 1980s, a paradoxical decade, is significant. Women had absorbed the lingua franca of feminism and donned their power suits, but the eighties was also the decade of backlash. A fifties feeling returned. Smith’s collages of this period are redolent with the imprint of memory, the patina of dim echoes from a half-remembered past of the paranoid and anti-feminist fifties. Indeed, for women coming of age at that time, the voices of limitation began in middle school and normally continued their entire lives. The phrase “A Girl with Brains Ought To…” (1983) on one collage is attributed to author and screenwriter Anita Loos (1889-1981). She famously delivered the line in “Gentlemen Prefer Blondes” (1925), “… so this gentleman said a girl with brains ought to do something with them besides think.” What seemed at the time like a clever bon mot also asks the question what should “a girl” do when not thinking? Become “My Fair Lady,” made to order for a man’s expectations? The artist’s ironic commentary is suddenly needed again in the age of #MeToo. 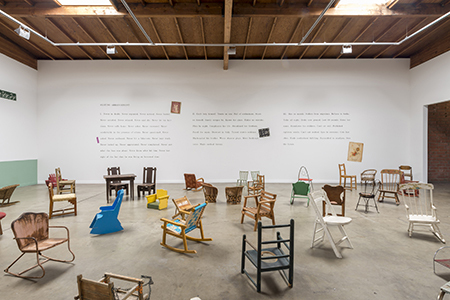 A leader in the long Los Angeles tradition of assemblage artists, Smith finds her objects, random flotsam, fragmentary jetsam of another age and remixes them for a contemporary age. The artist denies that these objets trouvés are “nostalgic,” and in fact her collages crucially eye this world with an ironical and critical eye, undimmed by sentiment but honed with social insight.